The left eye of the Mast Camera on NASA's Mars rover Curiosity took this image of the rover's arm on Wednesday, September 5. 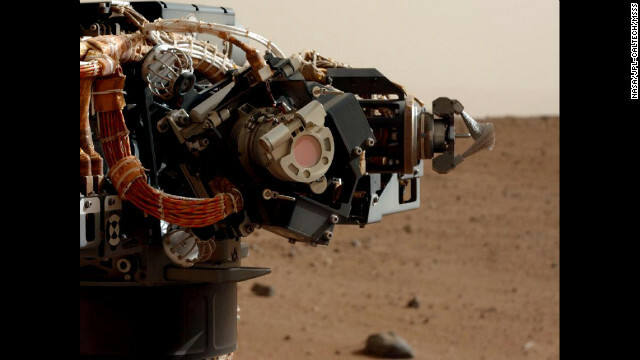 Curiosity arrived on Mars early on August 6 and began beaming back images from the surface. See all the images here as they are released. Fashion Week has begun in New York, but for space enthusiasts, the most exciting glamor shots are coming from Mars. The much-celebrated rover Curiosity has so far strutted 109 meters (358 feet) on the surface of the Red Planet, according to its odometer, and she's looking great, NASA scientists say. The 2000-pound SUV-sized rover has been on the surface of Mars for about one month, and operating as expected. "There have been no significant anomalies or wild cards thrown in where the performance on Mars differed significantly from the Earth," said Michael Watkins, Curiosity mission manager at NASA's Jet Propulsion Laboratory at a news briefing Thursday. "That's a real testament to the engineers that developed the system." NATION AS IN THE PAST. I REALIZE WE HAVE NO MONEY,BUT THE PRIVATE SECTOR DOES. WORK ON A JOINT EFFORT SERIOUSLY. IT CAN BE DONE AND IN OUR LIFE TIME. WHEN DOES IT SINK THE FIRST OIL WELL?